I got back from ALT Summit in Salt Lake City on Saturday and I still feel like I need a week to lie very still, speaking to no one, not wearing any tights. There are blog posts galore, spreadsheets and checklists, and even online classes to advise you on how to dress and what to wear at ALT. Because if you’re not wearing polka dots, stripes, and neon (preferably simultaneously) then you are bad blogger bad. For the longest time, I tried to pretend that I didn’t care and I’d just wear what the heckles ever. But at the last minute, I spazzed and I lugged six pairs of shoes to Utah. 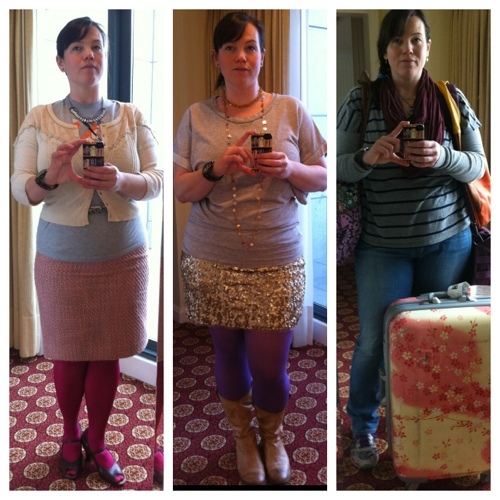 Day 1: Dinner with a sponsor – flowery embroidered skirt, orange tights, brown boots, a green sweater and a silver locket. 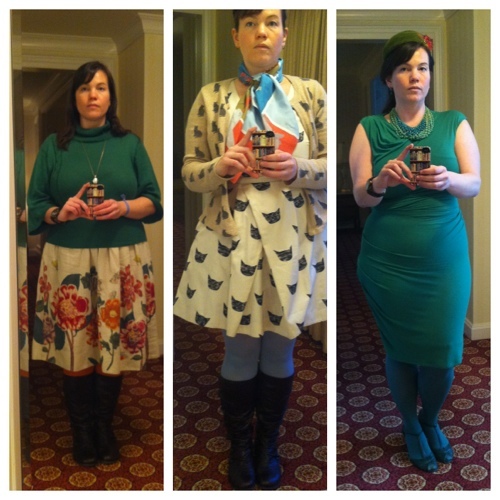 Day 2: Sessions and whatnot – cat dress, cat cardigan, blue tights, brown boots, my Emily + Ross Un-Tourist scarf. Day 2: Clue-themed party – green ruche-y dress, green tights, green t-strap sandals, a big green necklace, and a vintage hat from Decades. Not yet adhered: some ridiculous green-tipped fake eyelashes. Day 3: Sessions and whatnot – tweedy pink pencil skirt, pink tights, vintage-style heels, a softball team t-shirt featuring a bat-holding fox, a green skinny belt, vintage-style cardigan, and a rhinestone necklace. Day 3: Mini-party hosted by Blurb – gold sequined mini-skirt, purple tights, cowboy Frye boots, oversized gray sweatshirt, a long copper disc necklace and a short star necklace. Day 4: Room service breakfast in bed, half a craft class, and travel – Levis, sneakers, a long-sleeved gray t-shirt, a striped v-neck shirt, and a burgundy infinity scarf. Tagged as "ALT Summit", "blog conference"
I wish I had half of your style. Disappointed to learn that the first Day 2 outfit was NOT a combination of cats and birds, but rather all cats. I should have known. Thank goodness we don’t have to be stylish at Fitbloggin’. I don’t think I could hang at AltSummit. I seriously want that cat dress and cardigan. Can we please go shopping together? I love your style. I happened to wear that outfit in to Anthropologie and a shopboy there was having a major gush fest. Then he tried to sell me on a similar dog dress and cardigan that they’re selling now and I was all “oh hells no.” It is cat dress or naked. I’m still having trouble articulating what I really think about it all… would love to hear your thoughts! How did I miss the cat dress?! SO cute! But your sequin skirt was my fave. Glad to have met you there! Thanks for checking in, Sharon! I think the WhimseyBox dinner may be one of my favorite parts of ALT. I really liked the opportunity to just spend some quality time with a smaller group like that. Really nice to have met you!